Here is a traditional Israeli dish. 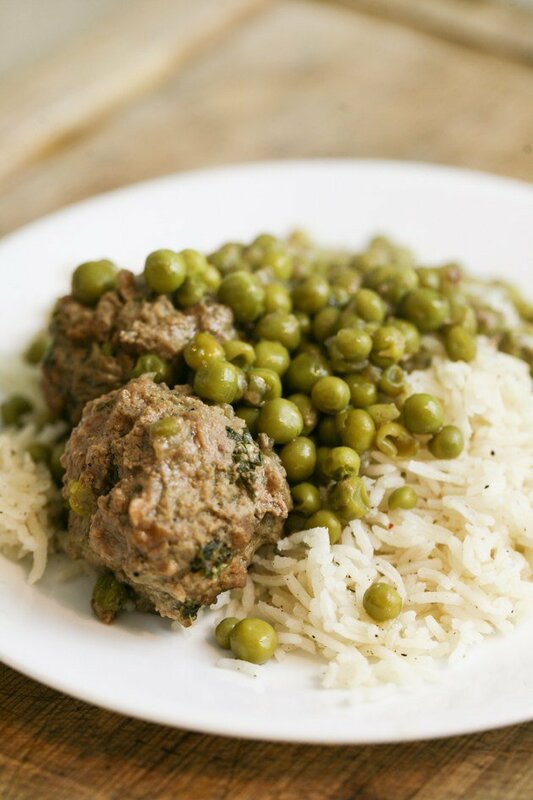 I can guarantee every Israeli under the age of 2 has already eaten these meatballs at least once, and this dish is going to probably be a regular throughout their lives. It’s easy, it’s healthy, and it’s very tasty. 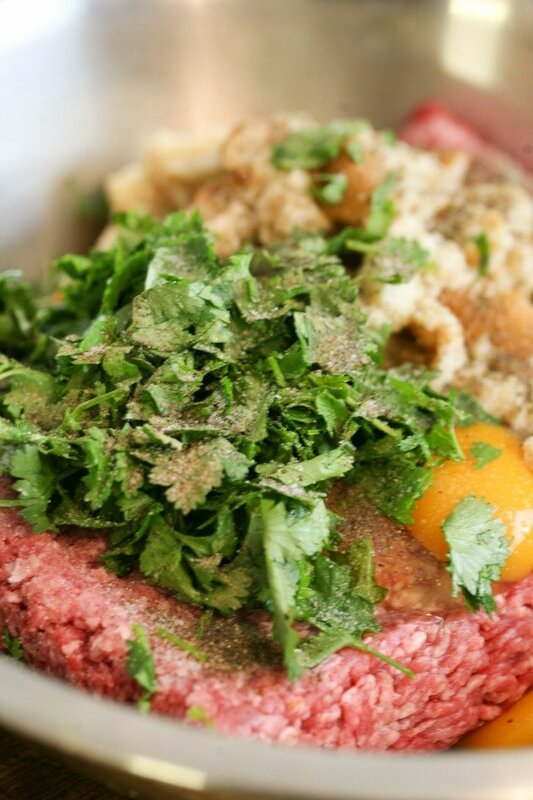 As kids, we used to eat this for lunch (lunch, not dinner, is the main meal in Israel. 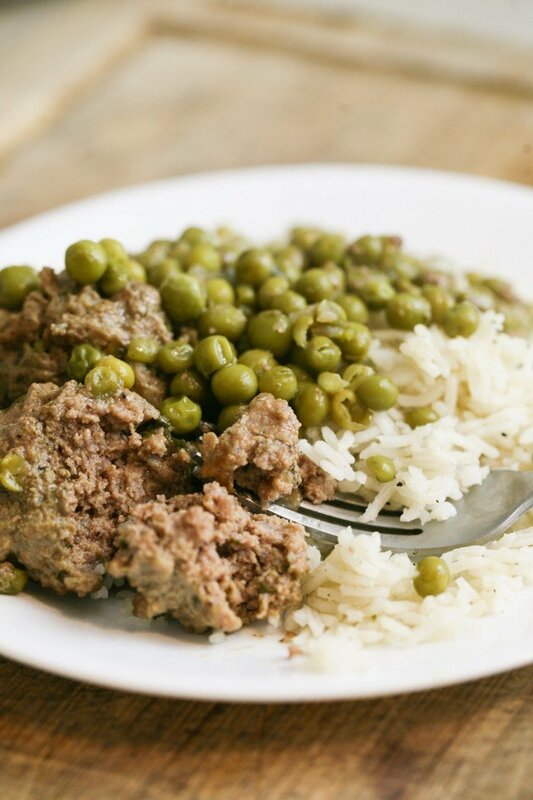 We usually eat eggs for breakfast, meat, side, and salad for lunch, and a sandwich for dinner), then the next day we would break the meatballs and add them with the peas into a pita bread with hummus and a simple Israeli vegetable salad. Oh, how good this is… My mouth is watering at the thought. 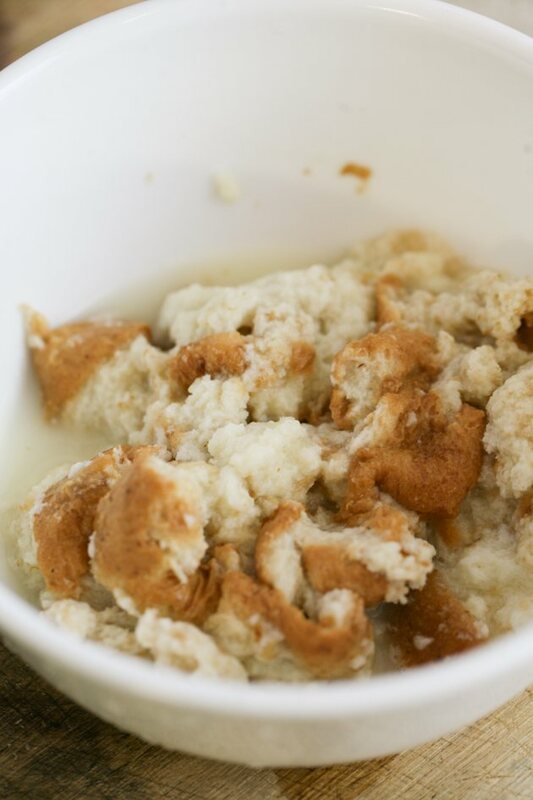 This is also a great dish for babies who are just starting to eat solids. 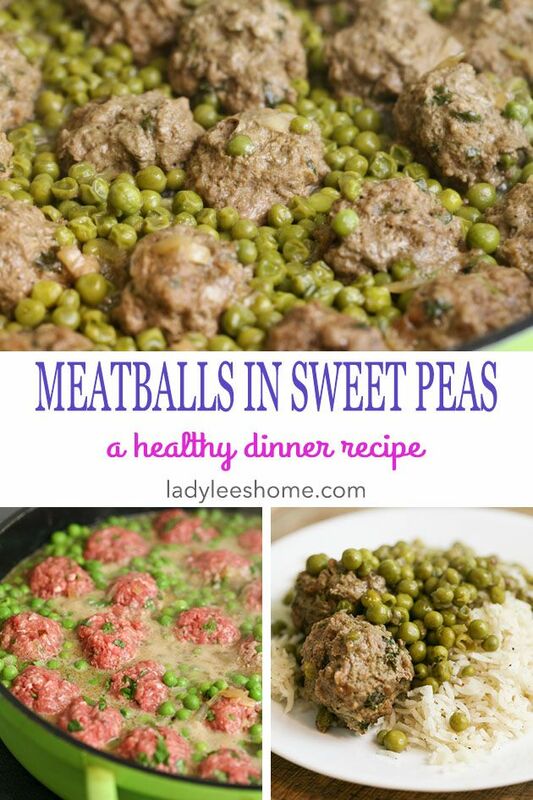 The meatballs are very soft and the peas too so you can mash the whole thing for your baby. 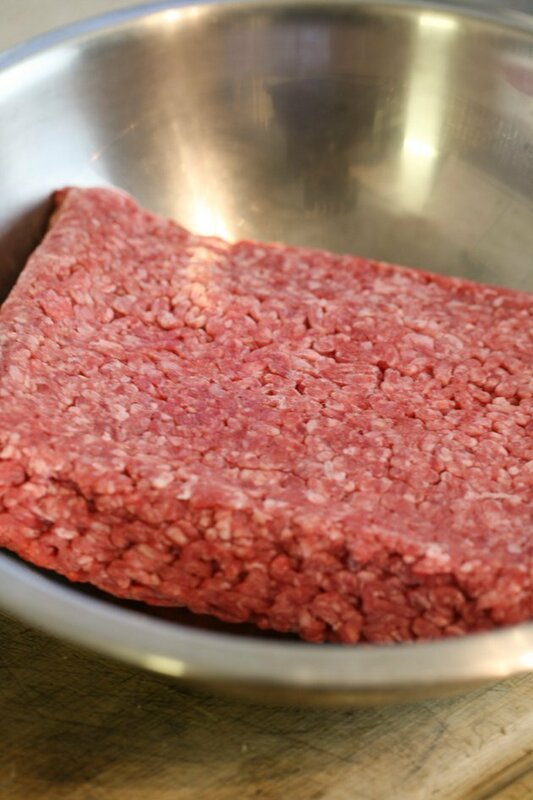 You start with a 2.25 lb pack of ground beef. I use the 15% fat beef (they sell a 2.25 lb pack at my local WalMart but you can use any percent of fat that you like or, of course, beef you raise on the homestead, just make sure you have around 2 lb of ground beef). 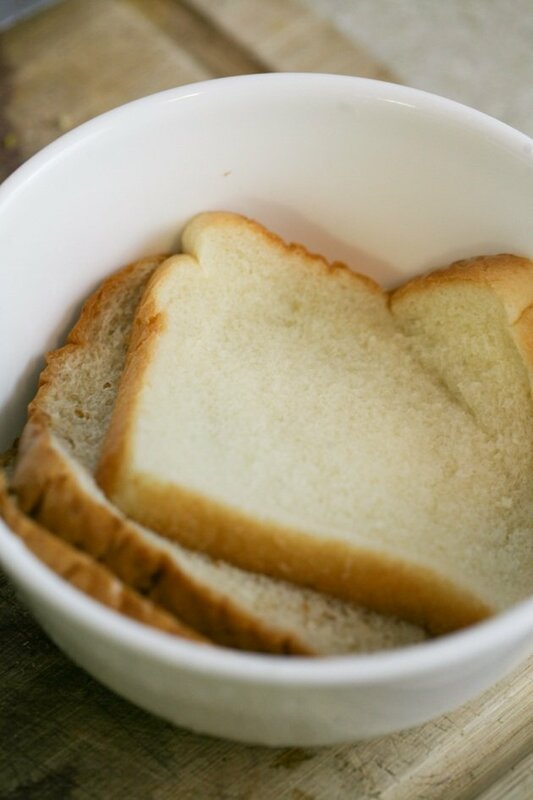 In a separate bowl, place three pieces of bread. I use white bread because it’s a bit softer but you can use any kind of bread you want. Then add some water to make your bread wet. We don’t want a soup here, we just want the bread soaked. 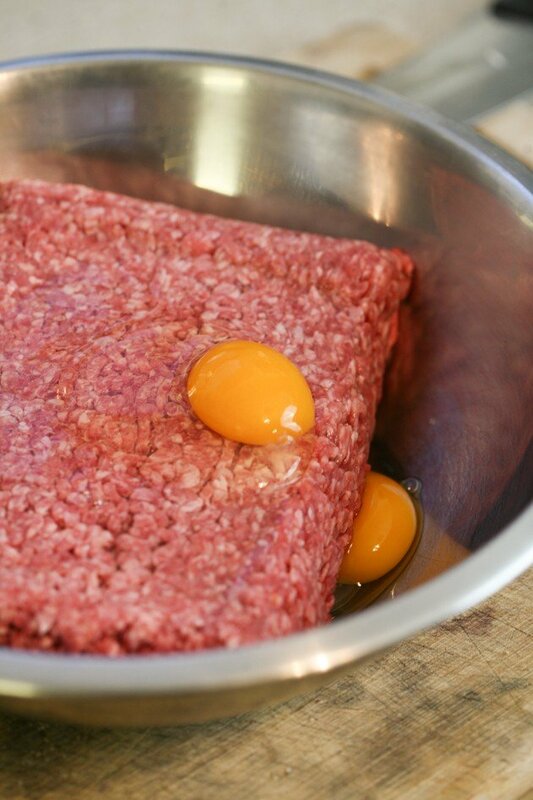 And add it to your meat (without the excess water). 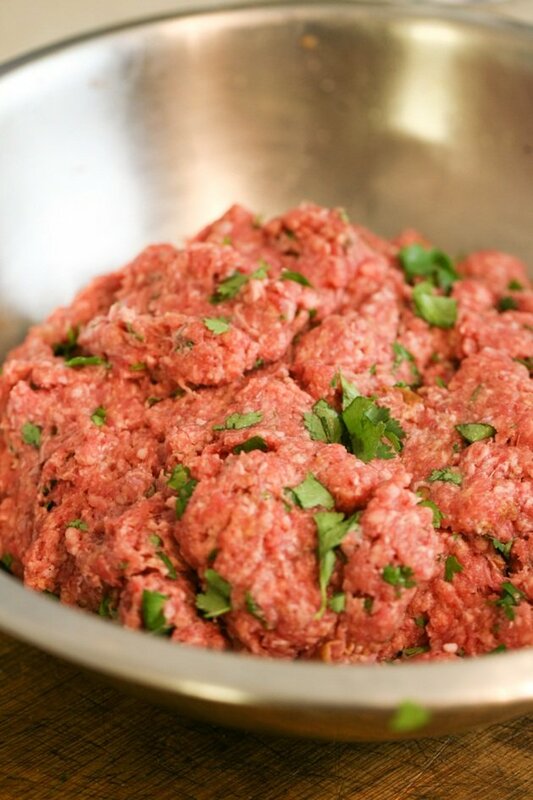 I do this with all my meatballs, it makes them much softer than if you’d add breadcrumbs. Next, grab a large handful of cilantro. 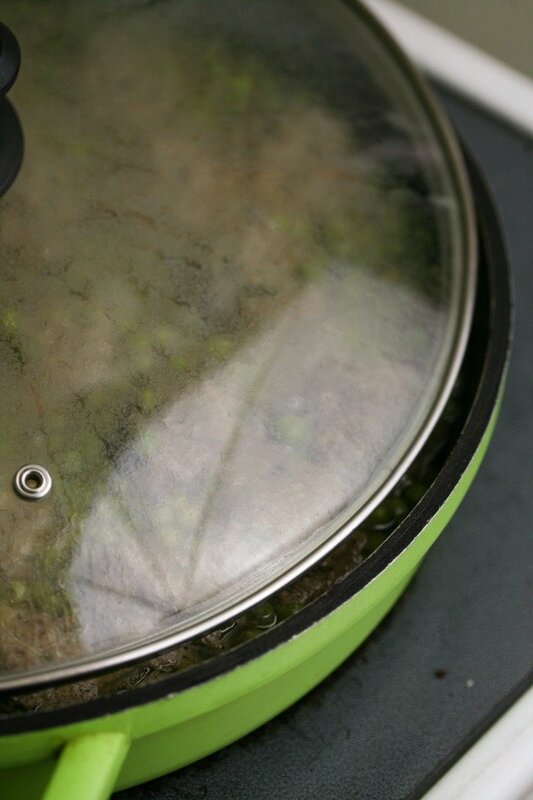 Wash it well and pluck the leaves off the stems. 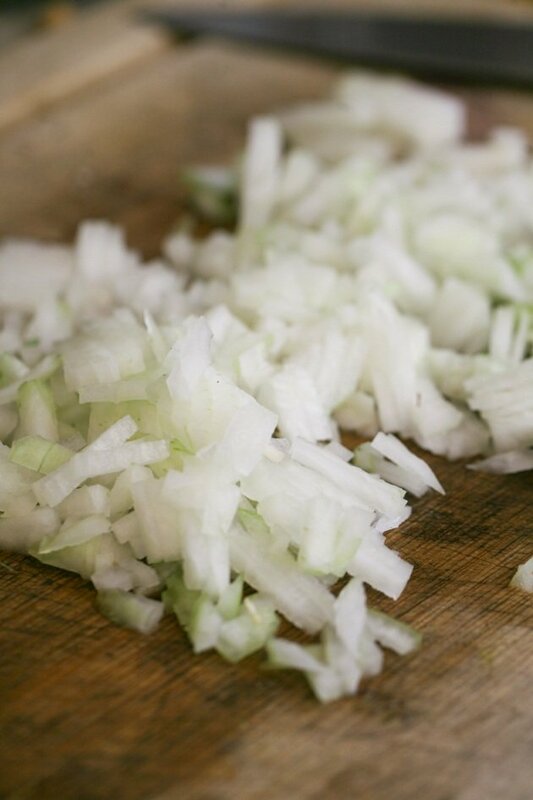 Place the leaves on the cutting board and chop them well then add them to the bowl. 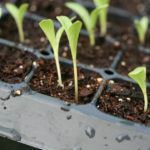 The stems can go to the compost. Lastly, add salt and black pepper to taste (I used about 3/4 teaspoon salt and 1/2 teaspoon black pepper). Use your hands to mix all of this well and set aside. 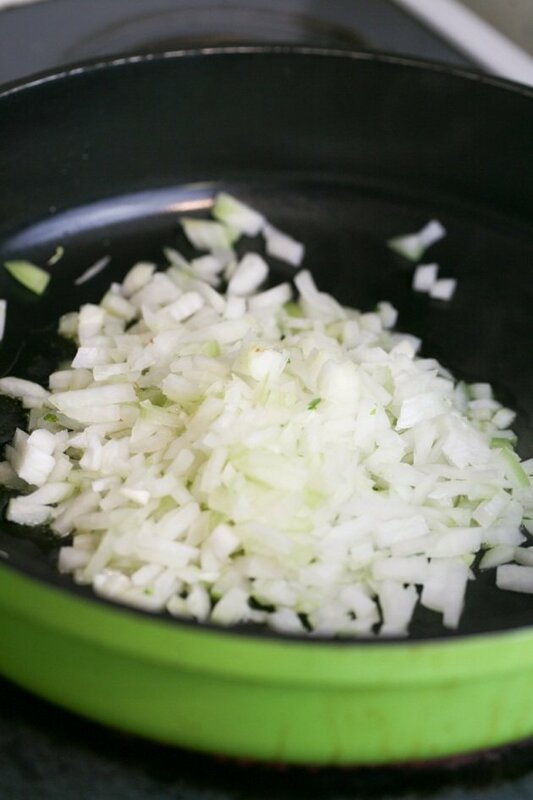 And saute until the onion starts to brown while stirring frequently. This will take about 15 minutes. 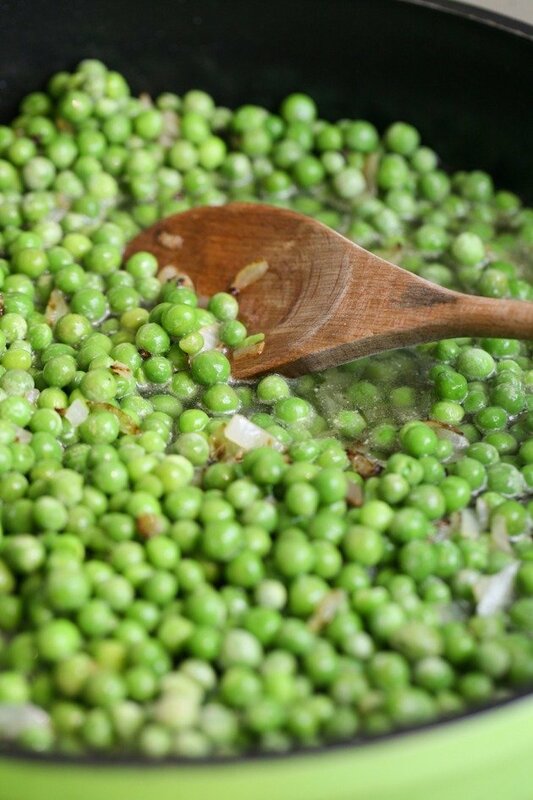 When the onion is ready, add a 2 lb bag of frozen peas, stir. 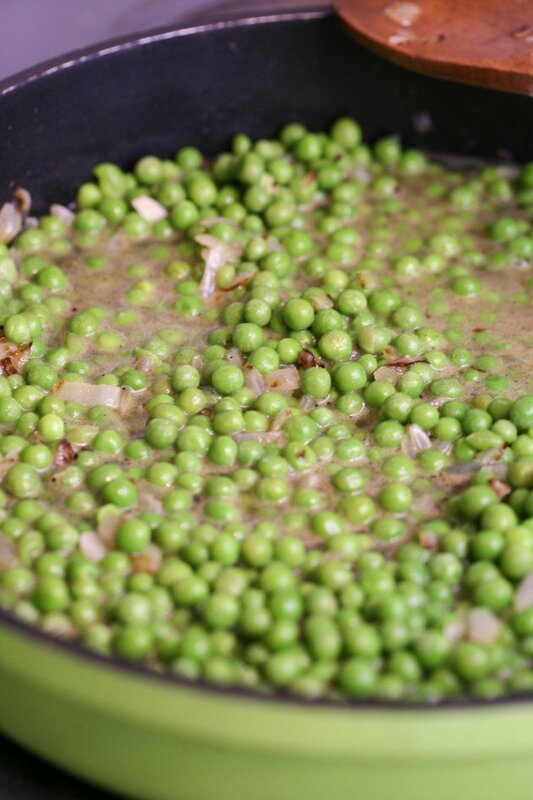 Right after you added the peas, add two cups of chicken stock or two cups of water and two tablespoons of chicken bullion flavoring. I use this one. 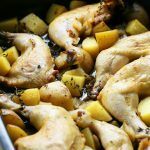 Even though I make my own chicken stock I always have chicken bullion flavoring on hand because I often forget to thaw my chicken stock before I need it for cooking. A good friend gifted me a Presto Pressure Canner so the next time I make chicken stock I’ll be able to can it instead of freezing it. It will make my life so much easier. 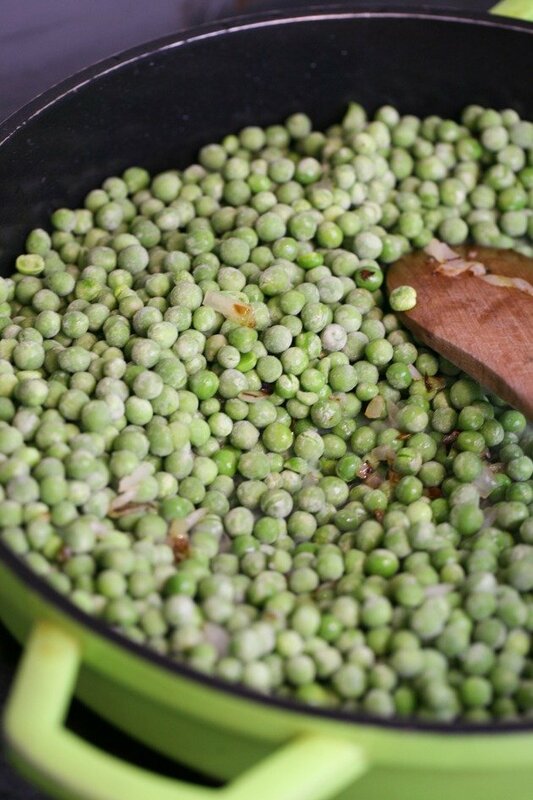 Give the peas a stir and also add some salt and pepper to taste. 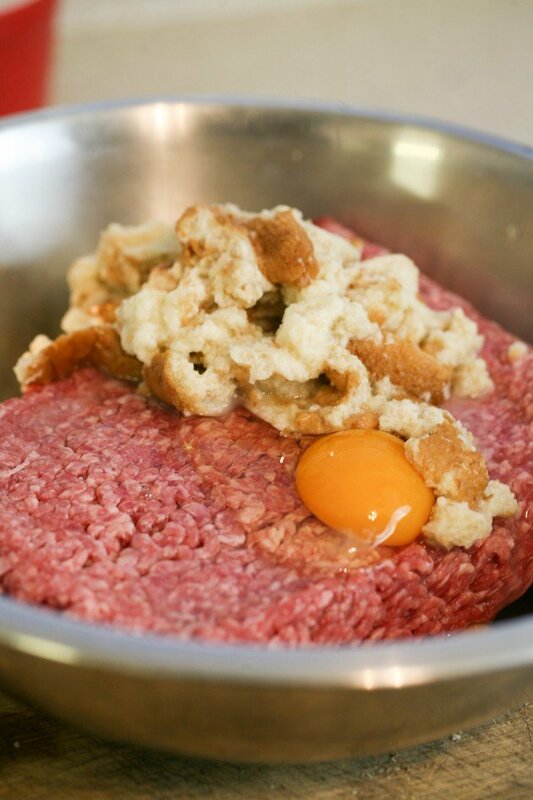 Next, make your meatballs from the mixture we made earlier and add them to the pot. 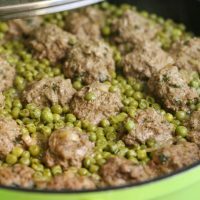 I use a wooden spoon to make room between the peas for the meatballs rather than placing them on top of them. Bring this to a boil, then lower the heat to medium, cover the pot and let cook for 30 minutes. After 30 minutes, crack the lid open just a bit to let some of the liquid evaporate. Cook for 10 more minutes. Turn the heat off and let the meatballs rest for a few minutes. I usually serve this with rice and a simple salad. 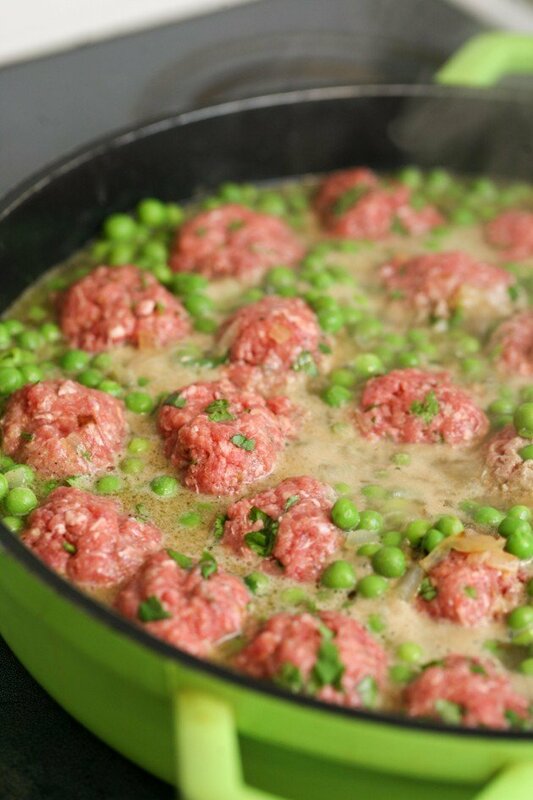 The meatballs are so soft and work so well with the peas. It’s a taste of home for me! Two cups of chicken stock or two cups of water and two tablespoons of chicken bullion flavoring. 1. 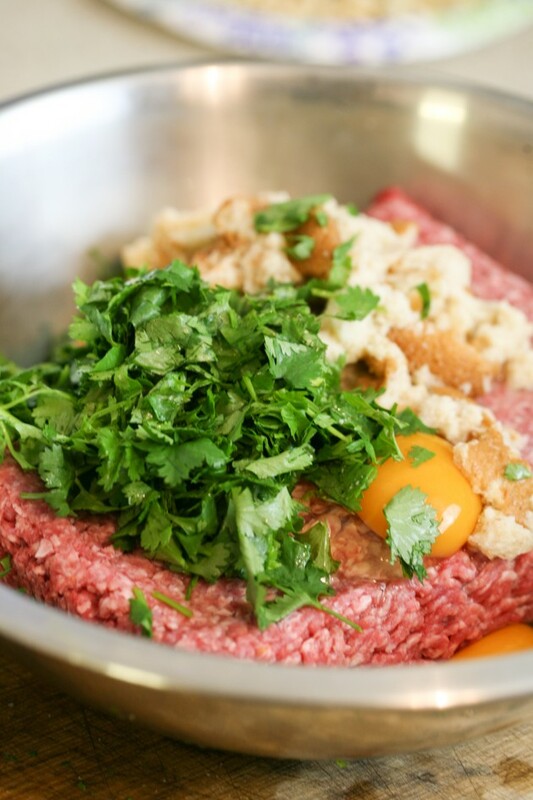 Add all the meatballs ingredients into a large mixing bowl and use you hands to combine them well, set aside. 2. To a shallow, large pot, add about 4 tablespoons of oil (any oil, I used olive oil). 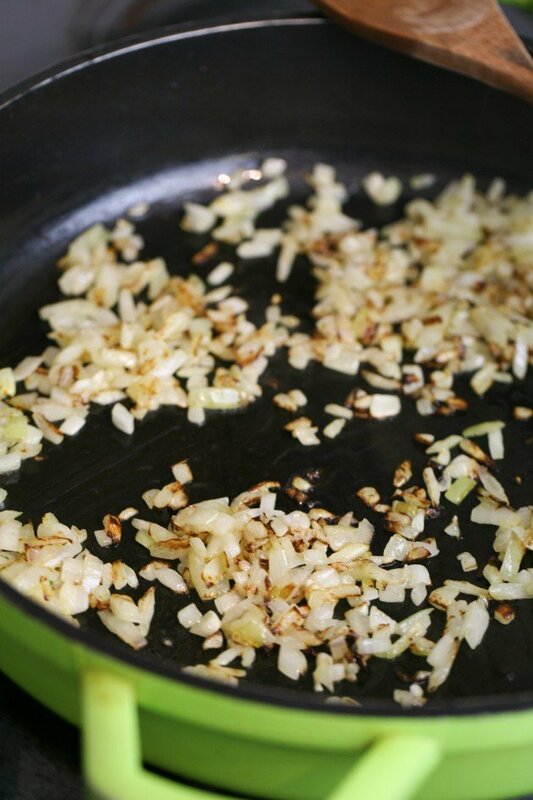 When the oil is hot, add the onion, lower the heat to medium-high and saute until the onion starts to brown. 3. Add the peas and chicken stock or water with chicken bullion flavoring. Also, add salt and pepper and mix. 4. Form the meatballs from the meatballs mixture and place them in the pot. 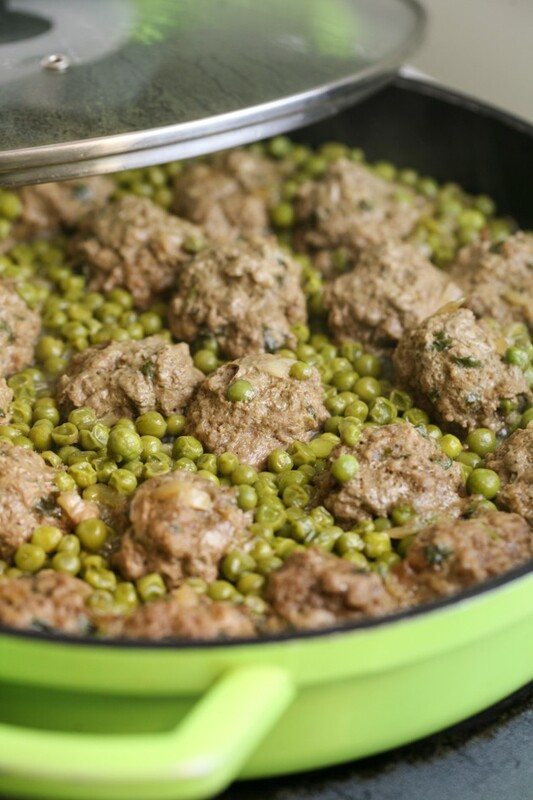 Use a wooden spoon to move the peas and make room for the meatballs. 5. Bring to a boil, then lower the heat and cook, covered, for 30 minutes. 6. After 30 minutes, crack the pot open just a bit to let some of the steam out. Cook like this for 10 more minutes. 7. Turn heat off and let meatballs rest for a few minutes before serving. ( I serve over simple rice).